One of the largest and most beautiful American commercial maps published in the 19th century. Map of the United States of America Including Canada, and a large portion of Texas, Showing Base Meridian and Township Lines of the U.S. Surveys, Including Lands alotted to the Indian Tribes west of the Mississippi, The various internal improvements. One of the most striking American large format wall maps ever issued. This is the 1862 American Civil War era case map of the United States by J. Calvin Smith and updated by J. H. Colton. The map covers from Austin Texas to the eastern seaboard and from Lake Superior to the Gulf of Mexico. Smith first introduced this map in 1843 buy the present much revised and updated example is the 1862 Civil War Colton edition. When it was introduced in 1843, this map was hailed as the largest, best, and most detailed map of the United States yet published. The largest and most complete Map of the United States ever published, being about six feet by seven, showing the base, meridian, and Township lines of the United States Surveys, the land allotted to the different Indian tribes west of the Mississippi river …. The above work obtained the premium, a silver medal, at the late Fair of the American Institute, New-York, as the best and most accurate specimen of Map engraving. The map indeed remains one of the largest and most attractive American commercial maps to appear in the 19th century. There are two inset maps in the lower right quadrant of southern Florida and North America. The southern Florida map identifies Miami and attempts to illustrate speculative islands in the Everglades. The North America Map covers all of North America in the Civil War Era configuration with New Mexico and Arizona Territories divided on the horizontal, and an enormous Nebraska Territory stretching to Canada. In Utah, 'Mormon Settlement' at the site of modern-day Salt Lake City, but Fillmore City is identified as the capital. In California, the Gold Region is noted near the Sacramento River. Of particular note is the map's impressive decorative boarder in which acanthus leaves embrace countless vignettes of American flora and fauna, American Indians, important cities, monuments, and more. At the top of the map a large eagle gripping the shield of the United States surrounded by 26 stars, each representing a state and containing a vignette. Four additional stars, which are partially shaded, include Iowa, Wisconsin, Texas, and another unidentifiable possible state. Smith first issued this map in 1843 in partnership with George E. Sherman, possibly as an optional accompaniment to D. Haskel and J. Calvin Smith's A complete descriptive and statistical gazetteer of the United States of America. It was also sold independently both as a folding map and as a wall map mounted on rollers. 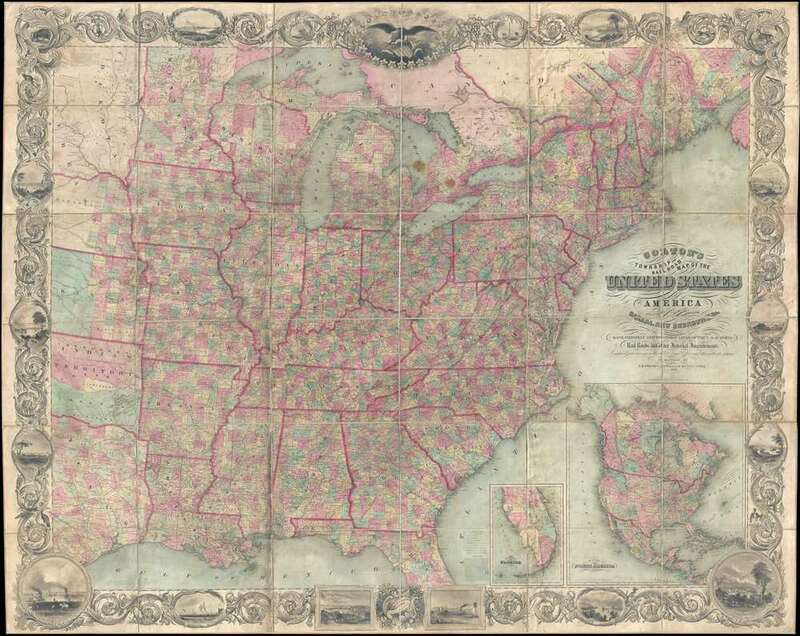 Smith reissued the map with various minor updates until 1853, when the map plates were acquired by J. H. Colton. Colton, wanting the most up to date map possible to reflect the rapid changes of the Civil War Era, complete extensive revisions to the map's geographical content, retaining the borders and overall composition. The map retains both the 1843 Smith copyright and has the renewed 1862 Colton copyright. All examples are rare. John Calvin Smith (1809 – June 11, 1890) was an American surveyor and geographer active in New York during the middle part of the 19th century. He was a charter member of the American Geographical and Statistical Society (American Geographical Society). He worked with other important New York cartographers including John Disturnell, George Sherman, and Samuel Stiles, with whom he often published under the Stiles, Sherman & Smith imprint. Stiles may have introduced Smith to J. H. Colton, who acquired many of his map plates in 1853. Despite being an important and prolific cartographer, much of his personal life and history are shrouded in mystery. Very good. Map exhibits overall toning and soiling, but is otherwise in remarkable condition. Has original linen backing and edging, both stable. Accompanied by original gilt stamped binder. Rumsey 2529.001. Phillips, P.L. (Maps) p.896. Wheat, Carl Irving, Mapping of the Transmississippi West, 1540-1861, 1471 (inset). . Ristow, W., American Maps and Mapmakers: Commercial Cartography in the Nineteenth Century, 318. OCLC 60688005, 41589181, 494980983.